Dubai: If someone told you they were driving at 140km/h on the roads of Dubai, you’d probably take it with a pinch of salt. But not quite if it’s Khowla Ali Al Beloushi talking. 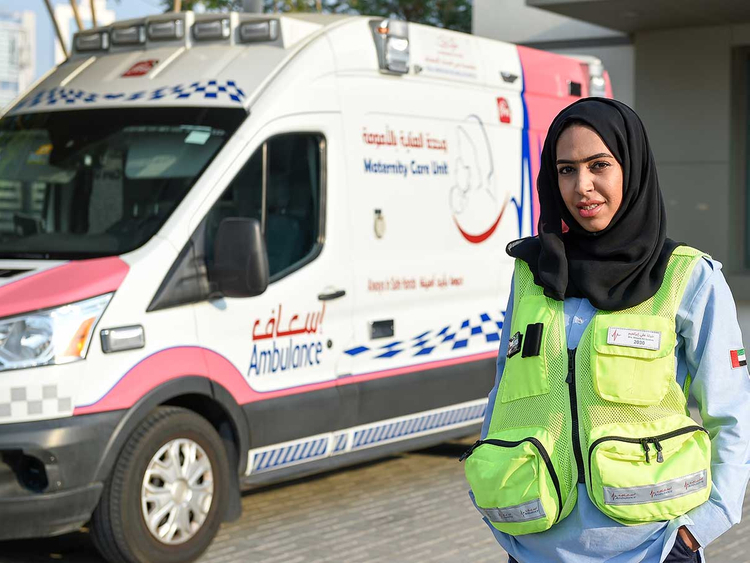 As an ambulance driver with Dubai Corporation for Ambulance Services (DCAS), she says her job sometimes demands that she takes that speed. But having been specially trained to respond in an emergency, she is a woman in complete control behind the wheels. A single mum with a seven-year-old daughter, she says her most challenging assignment since she joined DCAS last December was the response to a desperate call to help a young girl with a mental disorder. I have to be extra alert and respond to a situation in record time. I am supposed to know every road, bridge, tower and building in the city. An Omani national who grew up in the UAE, Al Beloushi was working with customer support at a public organisation when she came across the DCAS vacancy. “I applied because I liked the nature of the job. The best thing about it is that it gives you the ability to be among the first to help someone in need,” she says.